Steven (Chicagoland, United States) on 6 November 2012 in Documentary & Street and Portfolio. When war was declared in September 1939, the British Admiralty began to consider how best to use the Queen Mary for the war effort. After some debate, which included the strong possibility of conversion to an aircraft carrier, it was decided that because of her size and speed, she was best suited as a troop carrier. For defense, the ship was fitted with a wide array of armament, which included five 40 MM machine guns, similar to the one pictured here. The length of the barrels measure 94.8 inches, and the gun has a range from 3,000 to 5,000 yards. A crew of seven, headed by a gun captain, were assigned to man it. The crew were responsible for keeping the guns in good working order and ready for action, frequently firing them for practice. 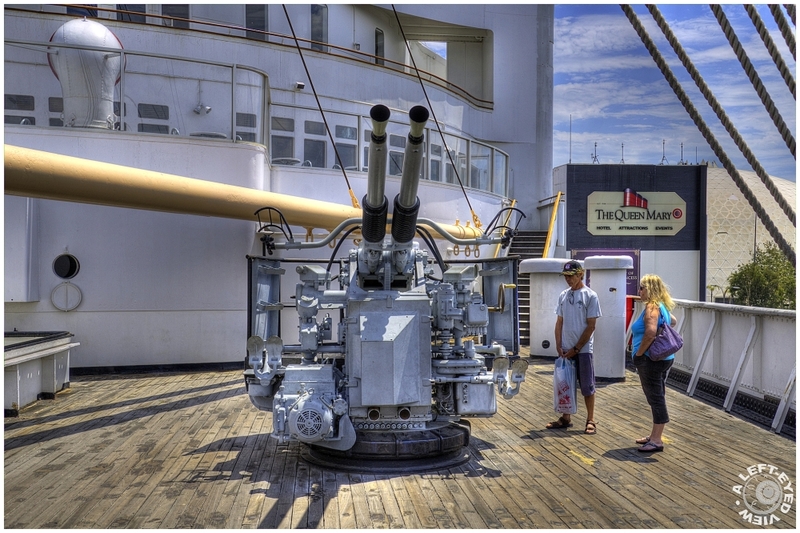 Despite the readiness of the Queen Mary's gun crews, she never encountered enemy action by air or sea, and never had cause to fire her guns in anger. Most armament was removed from the ship in May and June 1945, the remainder was taken off during her post-war refit in 1947. She represents a significant part of Britain's maritime heritage - really good frame. Pretty imposing view Steve, shows how innovative we can be when the backs are up against the wall. History comes to life - wonderful clarity and detail. Great capture and beautiful photo ! a very interesting document ... you don't see an ocean liner fitted with guns like these every day !!! A fine shot ... and wonderful processing. Wonderful capture and light! Fantastic image! Great information too! WOnderful image and thanks for the info - I did not know this bit of history. Great shot and HDR, plus the added bonus of informative text. I enjoy your posts, Steven. An impressive pair of guns! And even now it looks impressive. Imposing arms. The detail makes the scene more impacting.